Hallux varus deformity is less common as compared to hallux valgus. Different etiological factors have been explained in the literature for the development of hallux varus. The most common variety is due to surgical overcorrection of hallux valgus[1-4]. Other causes include congenital, idiopathic , spontaneous , post-traumatic and inflammatory arthropathies[8, 9]. Congenital hallux varus is less commonly noted than the acquired type and is best addressed in infancy. In the developing countries, untreated severe congenital deformities are seen due to socioeconomic issues. While treating neglected hallux varus deformity in adults, soft tissue contractures, bony deformities and arthritis of joints are the issues to be considered. In the case presented here, all these points are addressed in stepwise manner to give successful outcome. A 23-year-old male patient presented with right congenital hallux varus with duplicate great toe and syndactyly untreated since childhood. Apart from bad cosmetic appearance, patient was unable to wear regular footwear and had difficulty in pulling the trousers up in his routine life. There was no past history of any surgery or trauma to right foot. Clinical Examination: Patient had polydactyly with syndactyly of right great toe [Fig 1].These two great toes were almost at right angle to the first metatarsal [Fig 2A and B].Each great toe had a separate nail plate and medial great toe was little longer than lateral one [Fig 1]. Plantar flexion and dorsiflexion of 20 degrees each was possible at first metatarsophalangeal (MP) joint. No correction of deformity at MP joint towards lateral side was possible. Other than foot, there was no musculoskeletal or neurological abnormality. Radiological Evaluation: Weight bearing anteroposterior, oblique and lateral radiographs of right foot were taken [Fig 3]. Radiographs showed short first metatarsal with deformed head. Each great toe had proximal and distal phalanges. The distal phalanx of lateral great toe was trapezoidal. Only one sesamoid was present at MP joint. Both proximal phalanges were articulating with deformed medial aspect of first metatarsal head. Intermetatarsal angle (IMA) measured about 27 degrees. Other Investigations: Portable Audio Doppler study of right foot was performed. It demonstrated better vascularity of medial great toe than the lateral one. Treatment Planning: We planned treatment in two stages to avoid neurovascular compromise. First Stage: Lateral great toe needed to be excised as it was smaller than the medial one and had less vascularity on portable Audio Doppler study. Then gradual correction of medial great toe was planned with gradual soft tissue distraction using external fixator. Two distractors were planned, one at MP joint and another at tarsometatarsal (TM) joint. Second distractor was needed as it was metatarsus adductus and we wanted to include TM joint in future surgical procedure. Second Stage: As the patient was skeletally mature with deformed first metatarsal head and abnormal MP joint, we decided to opt for MP joint fusion after achieving correction of the deformity. Operative Technique: Surgery was performed under spinal anesthesia. Right foot was prepped with liquid betadine and sterily draped. Dorsal incision of approximately 3 cm was taken on lateral great toe centering head of first metatarsal. Lateral great toe consisting of proximal and distal phalanges was excised [Fig 4, A]. Kirschner wires (K-wires) were inserted in the following manner-first axial 1.5mm K-wire was inserted from distal to proximal phalanx of medial great toe. Two 1.8mm K-wires were inserted horizontally in the first metatarsal. Two more 1.8mm K- wires were inserted through medial cuneiform into the middle cuneiform. Distractors[Fig 4, B and C] were applied in the following manner. One distractor was applied between axial wire of great toe bent at 90 degrees and metatarsal K-wires. Second distractor was applied between k-wires of first metatarsal and cuneiform. Distraction of 1mm per day (one complete turn of 360 degrees of the distractor knob)was started at TM and MP joints from third postoperative day. 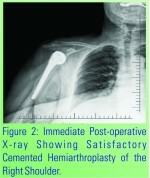 The patient was discharged on seventh postoperative day with loose dressing without slab. The patient was taught the procedure of external fixator distraction and did the distraction in increments of 1mm per day at both distarctors. He was also supervised every week in the outpatient department. 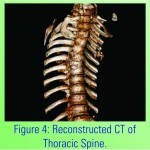 During the period of distraction, patient was kept non-weight bearing and care was taken to avoid pin tract infection. Distraction was continued for six weeks. Significant correction of deformity was achieved [Fig 5] without neurovascular compromise. After six weeks, the external fixator was removed and one week of waiting period was observed for pin tract healing. After one week, patient was again taken for surgery under spinal anesthesia. 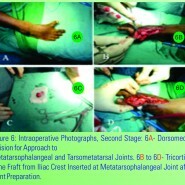 Dorsomedial incision of approximately 10 cm was taken starting 2 cm distal to metatarsal head and extending proximally along its medial border crossing first TM joint [Fig 6, A]. MP joint surfaces were prepared for fusion [Fig 6, B]. Tricortical bone graft was harvested from iliac crest and grafted at MP joint [Fig 6, C and D]. This added length to the first ray. Care was taken to align the joints so that great toe remains plantigrade. A 2.7mm dynamic compression plate with 2.7mm screws was applied on the medial side [Fig 7A to C].Medial plating was done to provide biomechanically better support during fusion and prevent recurrence of deformity. Plate was spanning both TM and MP joints.TM joint was stable and spanned without fusion in corrected position. One axial K-wire was inserted from distal phalanx, proximal phalanx, bone graft and first metatarsal into the medial cuneiform before applying the plate[Fig 7 B and C]. The axial K-wire was removed after four weeks. Patient was kept non weight bearing for two months and monitored for radiological signs of fusion at MP joint. Result: Patient started gradual weight bearing two months after second surgery. Bony fusion was achieved in 3.5 months. Anteroposterior and lateral radiographs taken at three years follow up show satisfactory alignment and fusion [Fig 8]. Though first toe was short but still it was in the acceptable plantigrade alignment [Fig 9].After correction, patient was painless on weight bearing and can carry out all daily activities without discomfort. Unlike preoperative status, now he can wear regular shoes and pull the trousers up without difficulty [Fig 10A and B]. This has improved his social activities. At present he is actively participating in sports activities like cricket. There is no recurrence of the deformity. The Revised Foot Function Index (FFI-R) improved to 65 from 120. Congenital hallux varus is a rare deformity. There are three types of congenital hallux varus- 1) Primary type is not associated with any other deformity. 2) Secondary type is associated with anomalies like polydactyly, syndatyly, metatarsus adductus, clubfoot etc [12-15]. 3) Tertiary type is associated with severe deformities like diastrophic dwarfism. This deformity can be addressed in childhood with soft tissue procedures like Kelikian and Farmers technique . When neglected, they present in adulthood with severe and rigid deformity with soft tissue contractures, bony deformities and arthritis. A single stage correction of such deformity can cause neurovascular compromise. Hence stepwise approach and gradual correction of the deformity is a safe method. This can be achieved with distraction using an external fixator. It works on the principle of distraction histiogenesis . We have used this principle in a case of a 23 year old male. His great toe deformity was neglected and rigid. It was so disfiguring that he came to us for amputation of the great toe. But we offered him the option of correction of deformity and kept amputation as a salvage procedure. We excised the lateral great toe and used external fixator for gradual correction of medial great toe. Two distractors were used in the external fixator assembly; one to correct hallux varus deformity at MP joint and other to correct metatarsus adductus deformity at TM joint. Satisfactory correction of the deformities was achieved in six weeks. During this time, soft tissues on the medial aspect of foot were stretched gradually; hence this case did not require any plastic surgery for the coverage. As metatarsal head was deformed, MP joint fusion was done at second stage. After correction, the great toe was shorter compared to normal side due to congenitally hypoplastic and deformed first metatarsal. We offered the patient option of lengthening of first metatarsal using external fixator, but patient refused it and is happy with the present results. Management of this case demonstrates that gradual distraction using external fixator and a stepwise approach has resulted in satisfactory correction and excellent functional outcome in a rigid neglected congenital hallux varus with polydactyly and syndactyly in adulthood. 1. Handelson, J.E. Congenital disorders of the toes. In: The Foot Book. Gould, J.S. (ed. ), Baltimore, Williams & Wilkins, 1988, p.107-108. 2. Kelikian, H. Surgical complications. In Hallux Valgus, Allied Deformities of the Forefoot and Metatarsalgia. Philadelphia, W.B.Saunders, 1965, p. 433-435. 3. McElvenny, R.T. Hallux varus. Q. Bull. N.W. Univ. Med, 1941, 15:277-280. 4. Miller, J.W. Acquired hallux varus: a preventable and correctable disorder. J. Bone Joint Surg.1975, 57A183-188. 5. William Malcolm Granberry and C. Hugh Hickey Idiopathic Adult Hallux Varus, Foot Ankle Int1994, 15: 197. 6. Jahss, M.H. Spontaneous hallux varus: relationship to poliomyelitis and congenital absence of the fibular sesamoid. FootAnkle, 1983, 3(4):224-226. 7. Mullis, D.L., and Miller, W.E. A disabling sports injury of the great toe. Foot Ankle, 1980, 1:2225. 8. Jahss, M.H. Disorders of the hallux and first ray. In Disorders of the Foot and Ankle, 2ndEd. Jahss, M.H. (ed.),Philadelphia,W.B. Saunders, 1991, p. 1084-1089. 9. Sherman, M.S. Psoriatic arthritis: observations on the clinical roentgenographic and pathologic changes. J. Bone Joint Surg, 1952, 34A831-842. 11. Betty JH. Congenital Anomalies of the Lower Extremity. In: Canale ST, Betty JH, eds. Campbell’s Operative Orthopaedics. 11th ed. Philadelphia, Pennsylvania: Mosby Elsevier; 2008:1072-1075. 12. Bilotti MA, Caprioli R, Testa J, et al. Reverse Austin osteotomy for correction of hallux varus. J Foot Surg 1987, 26:51. 13. Jahss MH, Nelson J.Duplication of the hallux. Foot Ankle 1984; 5:26. 14. Neil MJ, Conacher O. Bilateral delta phalanx of the proximal phalanges of the great toes. A report on an affected family. J Bone Joint Surg Br 1984, 66:77-80. 15. Thomson SA.Hallux varus and metatarsus varus. A five year study.ClinOrthop1960; 16:109. 16. Murray JH, Fitch RD.Distraction Histiogenesis: Principles and Indications.J Am Acad Orthop Surg. 1996 Nov; 4(6):317-327.